It's important to understand how all the parts of a garage door opener system contribute to the task of lifting a heavy door and closing it gently enough to avoid injuring anyone that might be in the doorway. The door itself glides on rollers inserted into metal tracks on either side, and the door opener, which is powered by a 1/2 to 1 HP electric motor, does the lifting. It wouldn't be strong enough to do the job, however, without a pair of torsion springs installed at the top of the doorway. The opener controls include a wall button and, usually, a remote controller that you keep in your car, and these control the motor through a panel in the motor housing. The safety sensors stationed on either side of the door way complete the picture. When your door doesn't work properly, you can usually diagnose the problem by checking systematically through a few components. Sometimes it pays to check the most obvious issues first, and when the door won't open, the most obvious problem is that it's locked. If not, check the wall control. Most have an LED that tells you the control has power. If this isn't lit, check for a tripped breaker in the main panel or a tripped GFCI outlet. If the door starts to open but won't move more than a few inches, the torsion spring may be broken. A broken torsion spring will also cause the door to slam closed instead of closing gently. You can usually tell if a torsion spring is broken by looking at it. If it is indeed broken, shut off the breaker and don't use the garage door, even manually, until you have it replaced. This is a dangerous job and not a suitable one for a DIY project. You should also check the tracks to make sure they aren't loose and are properly aligned. If the door opener hums, but the door won't open, there's a good chance the capacitor is bad. This is a cylindrical electronic component inside the motor housing, and when it's bad, it often looks scorched or has bulges. Purchase an identical capacitor and replace it. When you open the motor housing, take a good look at the gears. If they are worn, the pulley won't work, and they have to be replaced. The job of the safety sensors is to prevent the door from closing when something is in the doorway. If they are misaligned or blocked by cobwebs, the door won't close until you fix the problem. Clean the lenses of both sensors with a rag and check for obstacles that may be partially blocking the beam between them. If one of the sensors is flashing with a red or amber light, realign that sensor with its mate by loosening it and moving it until the LED shines solid green. If the sensors are attached to the door tracks, make sure the tracks are securely attached to the wall and aren't bent. 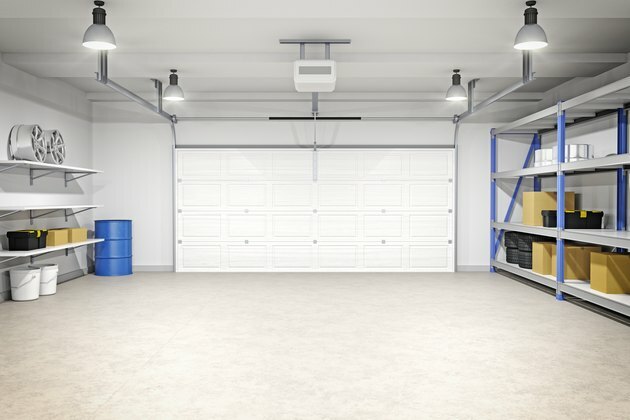 Most garage door openers have an open and close limit control. They are usually on the motor housing, and you access them by opening a panel or removing the housing cover. If the door stops short of closing, lengthen the close limit by turning the control knob in the direction indicated (usually counterclockwise). You can lengthen the open limit in the same way if the door doesn't open all the way. Be careful not to over-adjust these controls, or the pulley chain may slacken and come off the gear. If nothing happens when you press the remote button, change the batteries. Weak batteries are the number one cause of remote malfunctions. If the remote still won't work, the main wall control may be locked, and if so, you should see a flashing LED on the wall control. Press the control button and hold it for a few seconds in order to unlock the control.